This is the first in a series of field notes from Greenland. View all related Imaging the Arctic posts. Our first phase of fieldwork is based out of the small settlement of Niaqornat (70°47′20′′N 53°39′50′′W), located at the head of the Uummannaaq fjord in Greenland. The location gives good access to Baffin Bay for Dr. Kristin Laidre and her colleagues to study narwhals in the pack ice. They are recording the animals’ clicks and whistles to create acoustic profiles and learn about their communication, feeding behavior, and vulnerability to increased sound in the Arctic. The Greenland Institute of Natural Resources owns a small house in Niaqornat where we can live and feel at home. The settlement is a close-knit community of about 45 people, whose livelihood is based around sustainable hunting and fishing. There’s a balance of modern and traditional tools; the village has cell phone and internet access, a well-stocked shop, motorboats, as well as sled dogs and meat drying on racks outdoors. Niaqornat is featured in the beautiful documentary, The Village at the End of the World. We arrived in West Greenland on March 18, 2013 as a team of five people (from left to right) bioacousticians Jens Koblitz from the German Oceanographic Museum and Dr. Marianne Rasmussen from the University of Iceland, Husavik Research Center, technician Mikkel Villum Jensen, project leader Dr. Kristin Laidre from the University of Washington, and myself. The weather was unseasonably warm, an astonishing 50 degrees F in Kangerlussuaq, and felt like summer came months early. The heat was caused by an extreme high pressure system, known as a “block” over the Arctic that caused an inverse of chilly cold over much of the United States. Climate change is anticipated to cause more extremes in temperatures and this year’s Greenland blocking pattern is explained nicely in the Washington Post. 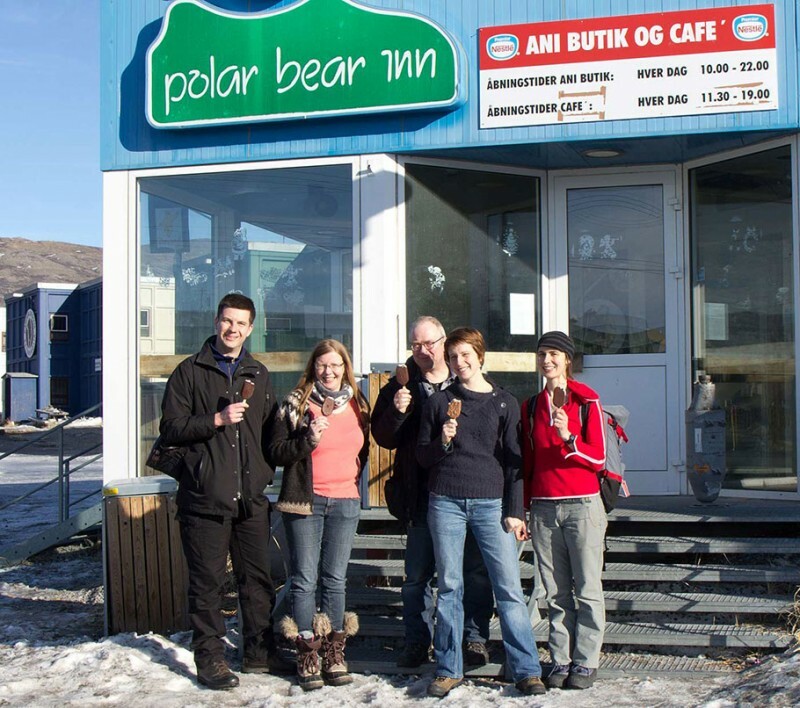 We coped with the heat during a layer over in Kangerlussauq by eating ice cream. As a result of this heat wave, there is very little sea ice around Niaqornat. This has impacted the locals abilities for spring hunting with dog sleds, and for the science means traveling far out into Baffin Bay to find adequate sea sea ice to safely land the helicopter and record narwhals. For our first day flying out to the sea ice, we traveled 99 nautical miles (114 miles) over Baffin Bay, almost half way to Canada, where the scientists found narwhals and could collect data. Niaqornat is marked, left image, March 21st, 2013, right image March 20, 2012, Modis Satellite Images from dmi.dk. This recent satellite photo (left) shows the extent of open water, a dramatic comparison to last year (right). Artistically, I am captivated by the patterns the sea ice, the colors and quality of Arctic light, as well as by the beautiful settlement of Niaqornat. 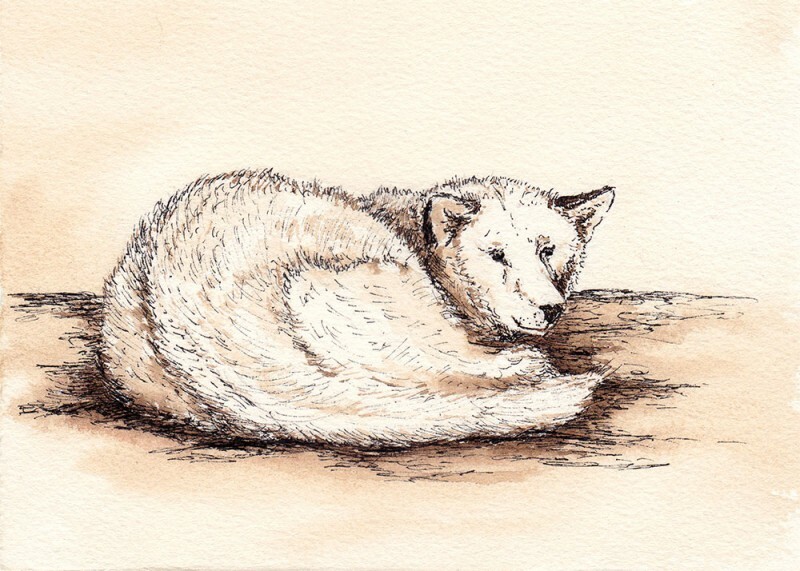 While here, I am sketching with ink and watercolor, as well as taking photos and audio recordings to illustrate elements of the scientific research, environment, and Greenlandic community. My fieldwork will be the basis for developing larger scale paintings and stories and stories in my studio. 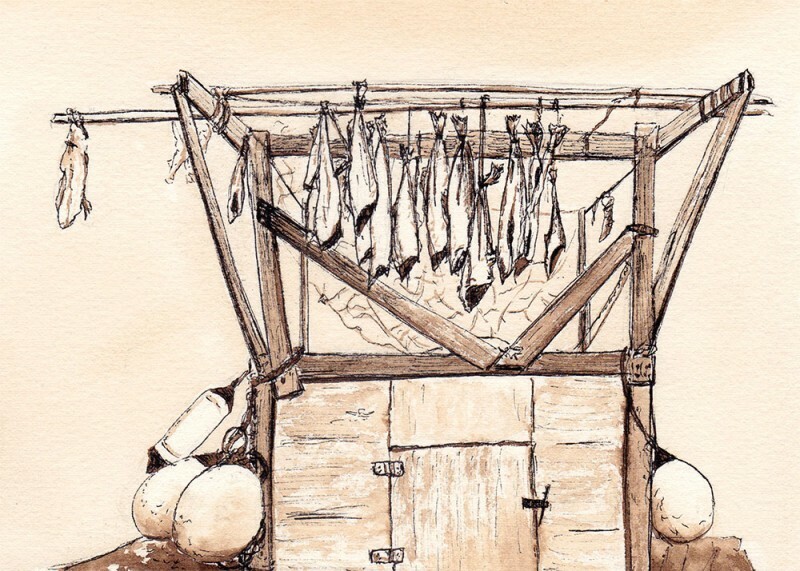 This is part of a series of field notes from Greenland. Read Field Notes #2: Narwhal Research or view all related Imaging the Arctic posts. A beautiful and captivating blog to read. Your project is an extraordinary combination of science and art coming together; that is how all art should be. 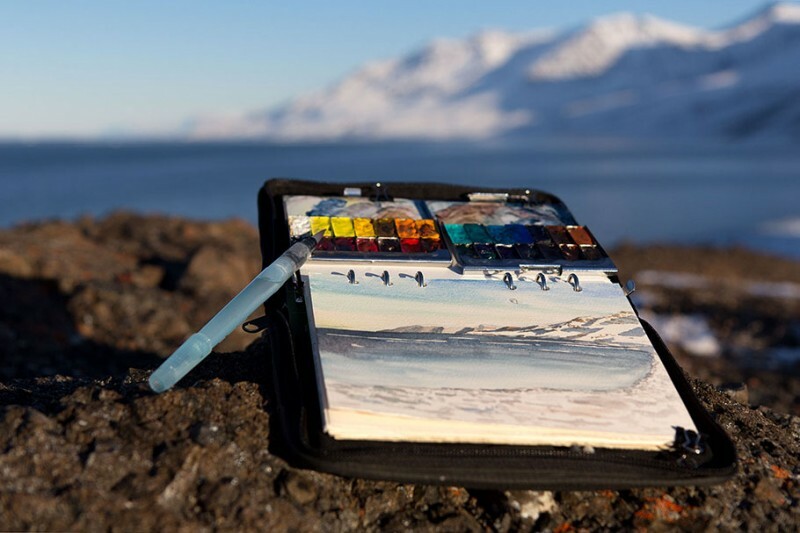 I myself am a passionate conservation and arctic artist, and there is no better way to promote such a message than through stunning or simple artworks. I look forward to reading and seeing more. 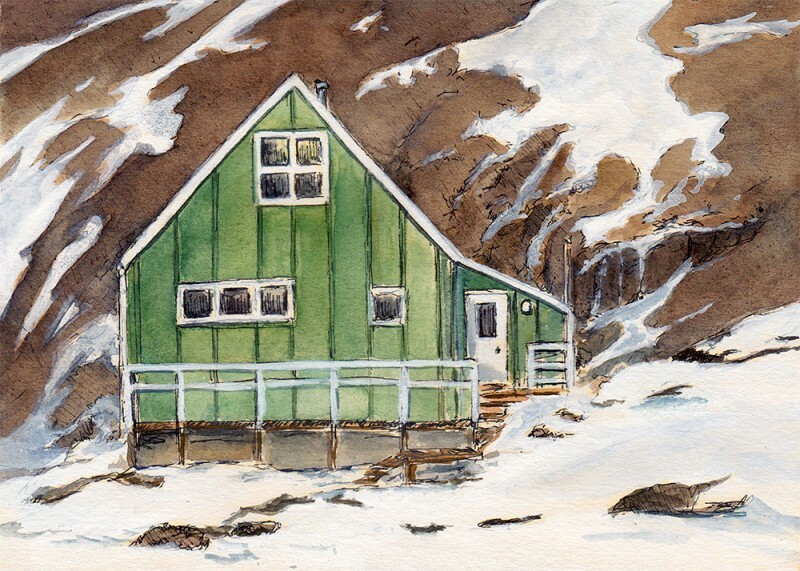 Personally I love the misty quality of watercolours for field sketching and particular for Arctic and Antarctic studies. Email (required) Will not be sold or published. Website Include a link to your website. Opening night for Imaging the Arctic was thrilling, thank you everyone who came! Imaging the Arctic opens this week in Seattle. I’m preparing Imaging the Arctic materials for exhibit. My latest painting and First Tuesday lecture details. Behind the scenes of a new iceberg painting. Icebergs continue to inspire me as I develop work for my fall Imaging the Arctic exhibit in Seattle. Learn about my upcoming exhibit and see the process behind a new painting. 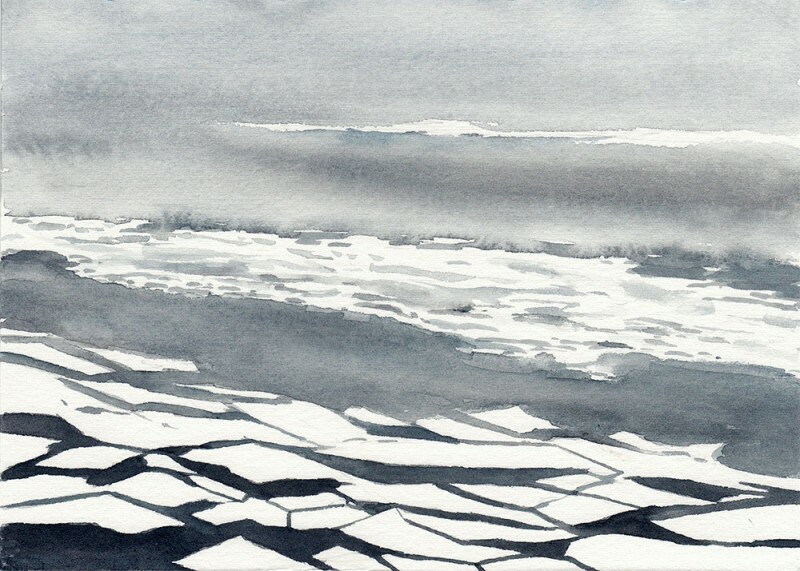 This is another painting from my aerial ice series, inspired by my time in Greenland. Get Expeditionary Art news once a month. Contact me with questions or comments.